Most homeowners use aluminum pans for cooking a variety of tasty dishes at home. However, every once in a while you may notice baked on grease stuck to your pans which can be difficult to remove. If you are looking for ways on how to clean baked on grease from aluminum pans, here are some of the best tricks that you can use! We will also talk about some of the best products that helped us, such as the Bar Keeper’s Friend Cleanser and Polish. You can read the full reviews below in this article. Allow the hot pan to cool down completely before you try this method. Use warm water along with any mild dishwashing soap to clean your aluminum pan thoroughly. Dry the pan using a soft cloth. Use a dish scrubber to remove any baked on residue from the bottom of the aluminum pan. If the grease is stubborn, you can add a small amount of boiling water to the pan and use a wooden spoon to scrape off the baked-on grease from the bottom of the pan. 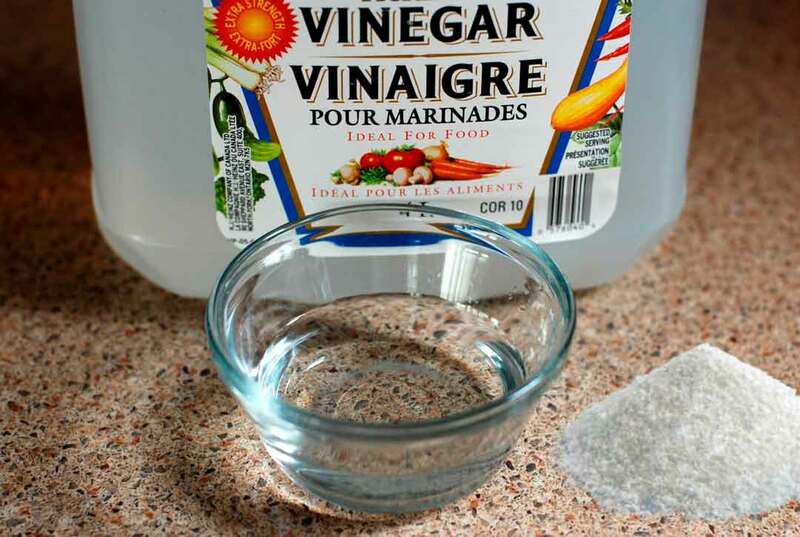 Add a quart of water into a bowl and add two tablespoons of white vinegar to create a solution. Alternatively, if you do not have white vinegar, you can also use lemon juice to make the mixture. Add the solution to your aluminum pan. Bring the pan to a boil and allow it to simmer for about 10 to 15 minutes. Turn off the burner after 15 minutes and allow the contents inside the pan to cool off. Then, you can dispose of the solution. Use a scrubber to scrub off any leftover discoloration from the bottom of your aluminum pan. Dry the pan thoroughly using a soft cloth. Allow the pan to cool off completely before doing this. Wash and clean your pan thoroughly using mild dish soap and a sponge to remove most of the grease from the pan. Take a spray bottle or a bowl and add three tablespoons of baking soda to it. Fill the rest of it with water. Mix it well to create a paste out of the solution. Spray or pour this solution on to your pan and allow it to sit undisturbed for a few hours. If the baked on grease is stubborn, you can even leave it on overnight. However, you can get the best results when the baking soda solution is still wet, and you do not allow it to dry off. Spray a solution of white vinegar and water on top of the pan and allow it to sit for a few minutes. Scrub the bottom of the aluminum pan with a soft sponge to remove the grease effectively. Rinse the pan in warm water and dry it off with a soft cloth completely. Allow your pan to cool off completely. Add a bit of ketchup or tomato paste to your aluminum pan. Let it sit for 20 minutes. Take a sponge and start scrubbing the bottom of the pan. Be careful as you do not want to be too harsh and damage the bottom of your pan. It is best to use a soft hand when scrubbing; however, you might need to do this for a while before you start to see any results. Rinse off your pan with warm water. Add a few drops of any dishwashing soap to the pan and scrub it once again to remove any residue of ketchup and also the acidic smell and taste. Dry off your pan thoroughly with a soft cloth. If you pan is still hot, allow it to cool down first. Add some boiling water to your pan and let it sit for a few minutes. The boiling water will work on the grease to loosen it up and make it easier for you to remove. Add a few drops of any dishwashing soap to a brush or a sponge. Since the water in the pan will still be hot, it is crucial that you are careful with your hands when using this method. You can use a brush or a sponge with a long handle attached to it. Scrub the bottom of the pan well. You will find that the grease has loosened up significantly and you can remove it with the help of the soap and brush. Rinse off the pan with warm water and dry it off thoroughly with a towel. Add cream of tartar to water in a ratio of 3:1. Apply this paste on to your pan in section and let it sit undisturbed for about 10 minutes. Using a damp sponge, scrub the bottom of the pot to remove all the baked on grease effectively. Rinse off using warm water and soap and dry the pan well using a soft cloth. 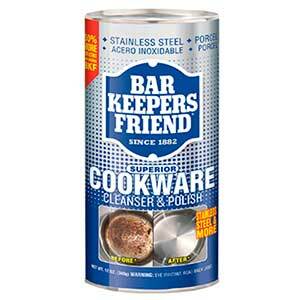 Bar Keepers Friend Cookware Cleanser & Polish is by far the best product we ever used. It removes baked-on stains from aluminum cookware with ease. The great thing about this one is that you can use it not just for aluminum, but stainless steel, porcelain, ceramic, or chrome. Removes all kinds of grease stains, food residue, and even limescale. Bar Keeper’s Friend Cleanser and Polish is our top recommended pick for the best cleaners which can remove baked-on grease from aluminum pans. This cleaner is 50% stronger than any other, yet, gentle enough to never damage the surface of your aluminum pans. Bar Keeper’s Friend Cleaner and Polish is the top choice for cleaners on the market just because of how easy it is to use and how strong the formula is; breaking down old, stubborn, baked on grease stains without any hassle. The product is a complete hassle free one, where all you need to do is sprinkle a small amount on to your aluminum pans, scrub, and just rinse it off! Yes, it is that simple! One of the best things is that this product is so affordable, and you need to use very little of it to get amazing results! Very little product actually required. While there are several products on the market which you can explore, Bar Keeper’s Friend Cleanser and Polish has taken away the crown as our top pick of the best cleaners that can remove baked-on grease from your aluminum pans. 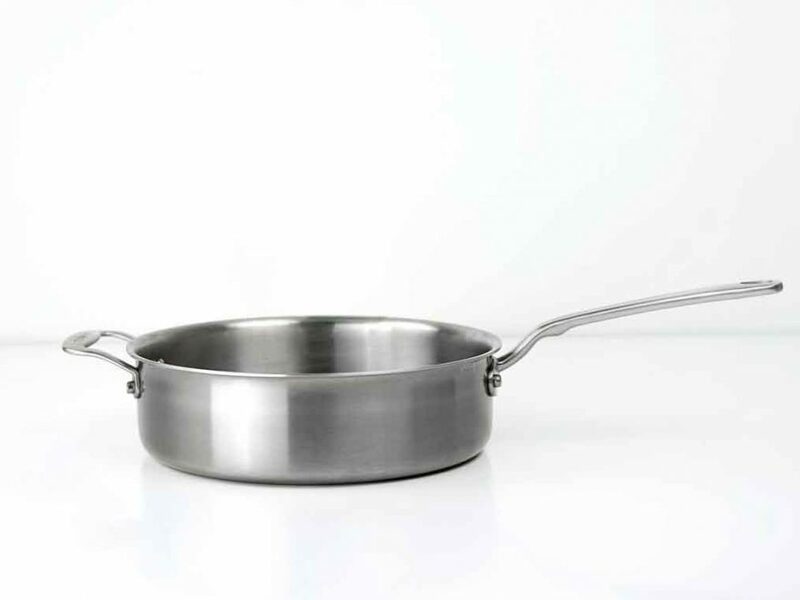 Click here to check other customer reviews on Amazon and find out all about this fantastic product which can make cleaning your aluminum pans a breeze! 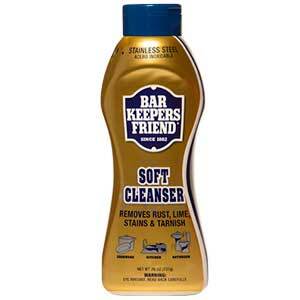 Bar Keepers Friend Soft Cleanser is a milder version of the one we discussed above. It also works great on most of the stains, but it is a less abrasive solution. Doesn’t contain any harsh chemicals making it the safest option you can get. The active ingredient is oxalic acid, which is found in many plants. Moving on to our second pick of the best cleaners which can remove baked-on grease from aluminum pans, Bar Keeper’s Friend Soft Multipurpose Cleanser comes as the runner up. If you are looking for a milder formula for cleaning off the stubborn baked-on grease from your aluminum pans, then a soft cleaner is your best option. Bar Keeper’s Friend Soft Multipurpose Cleanser is just the product that you need in this case. This mild cleanser works like a charm on removing all kinds of stains, burnt residue, baked on grease, spills, marks and even scratches off of your aluminum pans. The best part is that it does all of this with a mild and gentle liquid formula which adds shine to your otherwise dull aluminum pots and pans. Unlike other cleaners on the market, this liquid soft cleanser does not contain harsh, abrasive chemicals. This makes it completely safe to use regularly on your kitchen aluminum pans. The product also ensures that it does not leave behind any sort of gritty residue on your cookware after use. Your aluminum pans will shine as bright as a new product once again after using your handy Bar Keeper’s Friend Soft Multipurpose Cleanser! For those who are looking for an easy to use, powerful, yet a gentle solution for cleaning off the baked on grease off your aluminum pans, Bar Keeper’s Friend Soft Multipurpose Cleanser is one of the best products that you can find on the market. The formula is so gentle, yet, it works its wonders in less than a minute! You can also keep the solution on your aluminum pan surface for a more extended period without worrying about damaging the surface at all! Remove scratches, stains, burnt on residue and unsightly marks with this gentle, yet powerful cleaning solution! Click here to check other customer reviews on Amazon and find out all about this fantastic product! Finally, the third item on our list is the Bon Ami Cleanser and Polish Powder. The main difference you will find in this cleaning formula compared to the other ones is the fact that this is a powder-based solution. The ingredients in this cleaning solution are entirely non-toxic. Each component is made of degradable cleaning agents, making it completely safe to be used in your kitchen for everyday use. 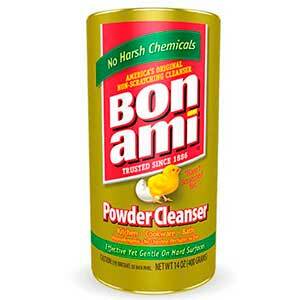 Bon Ami Cleanser and Polish Powder removes all kinds of build up, burnt residue, scum, and of course, hard to remove baked-on grease from your aluminum pans in no time. The best part is; your aluminum pans get their natural shine and sheen back and look absolutely new in no time! Fast working solution; just pour, scrub and rinse out! Finally, after scouring the markets, we have found the best solution in powder form; the Bon Ami Cleanser and Polish Powder. Not only does this solution effectively removes all kinds of stains, scum, residue and baked on grease, but it also brings back the shine to your beautiful aluminum pans. Click here to check other customer reviews on Amazon and find out all about the fantastic cleaning and polish powder solution; Bon Ami Cleanser and Polish Powder.